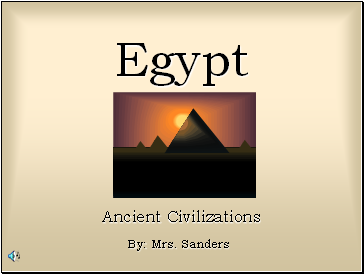 Ancient Egypt was the birthplace of one of the World’s greatest civilizations. It was far more advanced than European tribes of the same time period, who were still in the Stone Age. 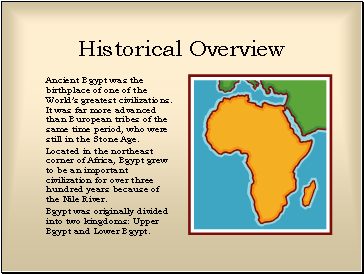 Located in the northeast corner of Africa, Egypt grew to be an important civilization for over three hundred years because of the Nile River. 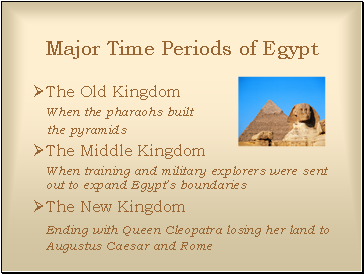 Egypt was originally divided into two kingdoms: Upper Egypt and Lower Egypt. 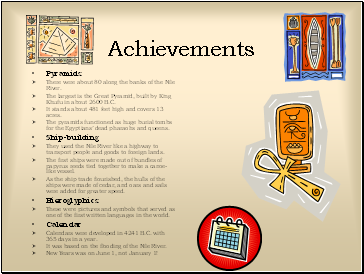 Pharaoh was believed by the Egyptians to be the supreme ruler chosen by the gods to lead his people. They believed that when a man became a pharaoh, he also became a god. 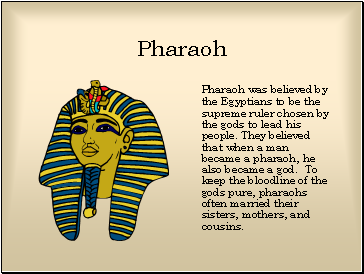 To keep the bloodline of the gods pure, pharaohs often married their sisters, mothers, and cousins. 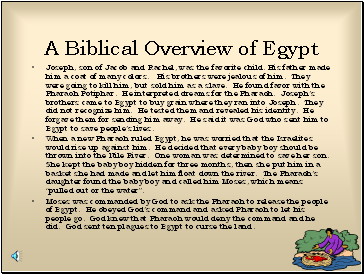 Joseph, son of Jacob and Rachel, was the favorite child. His father made him a coat of many colors. His brothers were jealous of him. They were going to kill him, but sold him as a slave. He found favor with the Pharaoh Potiphar. He interpreted dreams for the Pharaoh. Joseph’s brothers came to Egypt to buy grain where they ran into Joseph. They did not recognize him. He tested them and revealed his identity. He forgave them for sending him away. He said it was God who sent him to Egypt to save people’s lives. When a new Pharaoh ruled Egypt, he was worried that the Israelites would rise up against him. He decided that every baby boy should be thrown into the Nile River. One woman was determined to save her son. She kept the baby boy hidden for three months, then she put him in a basket she had made and let him float down the river. The Pharaoh’s daughter found the baby boy and called him Moses, which means “pulled out or the water”. Moses was commanded by God to ask the Pharaoh to release the people of Egypt. He obeyed God’s command and asked Pharaoh to let his people go. God knew that Pharaoh would deny the command and he did. God sent ten plagues to Egypt to curse the land. There were about 80 along the banks of the Nile River.